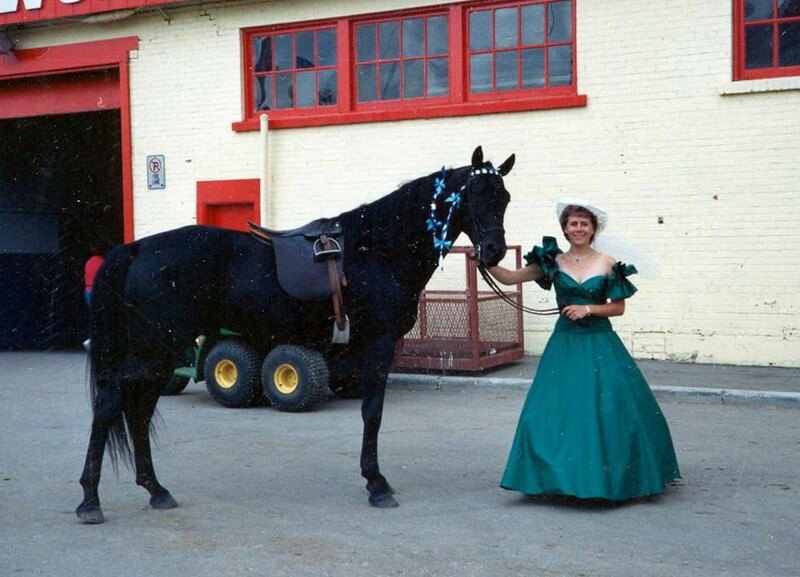 When we last looked in on my journey with horses, I’d just rehomed my sweet, fat pony, Houdini, and moved to Alberta. 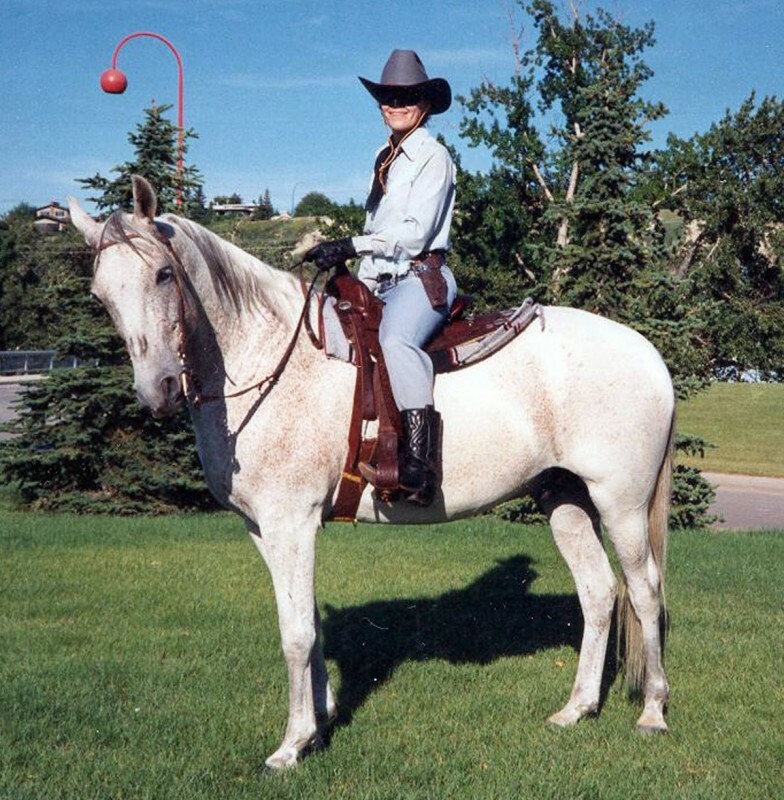 Calgary … home of the Calgary Stampede, Spruce Meadows, and many more things of a horsey nature. I actually arrived in Calgary in the middle of Stampede week, an auspicious beginning to what would be a long residency. By early fall, with home and employment settled, I was seeking out a place to ride and continue the learning I’d begun at the Fort St. John Equestrian Centre. I found my new equine home just east of Calgary near Delacour, Calta Stables. 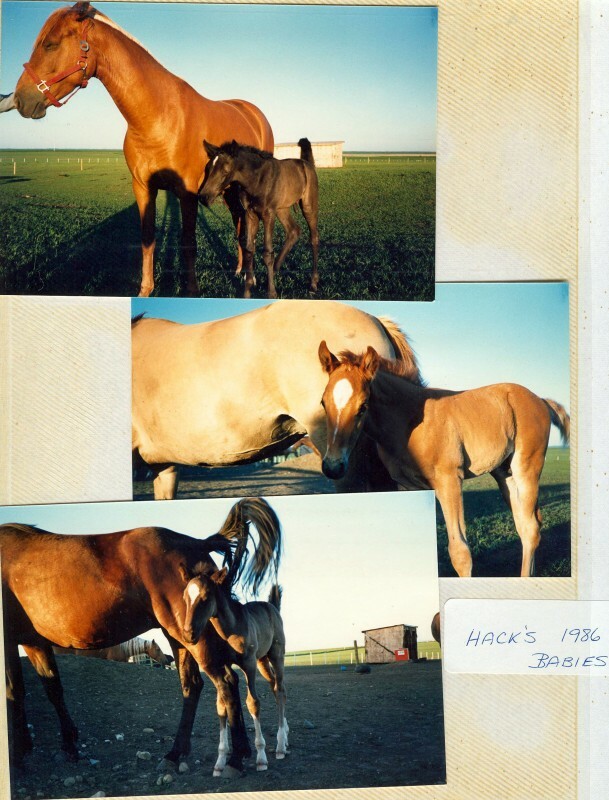 The Hack family, who owned and operated Calta Stables and raised Tennessee Walking Horses, was as welcoming as they were knowledgeable and offered weekly lessons in English and Western riding. The Hacks owned some lovely walking horses but, with my interest in competing in jumping and dressage, I opted to ride a horse of the trotting variety. For one or two lessons it was the reliable and ultimately long-lived Goldie, the palomino Quarter Horse who was in his forties when he passed on. I quickly advanced to a younger, more energetic horse, Daisy, a dun Quarter Horse. And then along came Stan (Fez Rebestan on his papers), a grey Arabian gelding owned by one of Calta Stables’ boarders. Stan had been shown extensively on the Arabian circuit and was extremely well trained. His owner offered him up as a lease to the stable when she decided to move over to Quarter Horses and start training her first show prospect. Stan was adorable, fun to ride, my favourite breed, and grey (which reminded me of those first Arabs I fell in love with). I took lessons on Stan, participated in the annual Easter clinic with Heather Cormie, rode him in an open show at Indus and just had a fabulous time … until his owner decided to put him up for sale. I thought hard about buying Stan but, as much as I loved him, he had a tumour under his tail that had been diagnosed as melanoma and even though it was currently dormant, his future felt too uncertain for me. Sadly, the lovely Stan only lived a couple more years until the cancer progressed and ended his life. 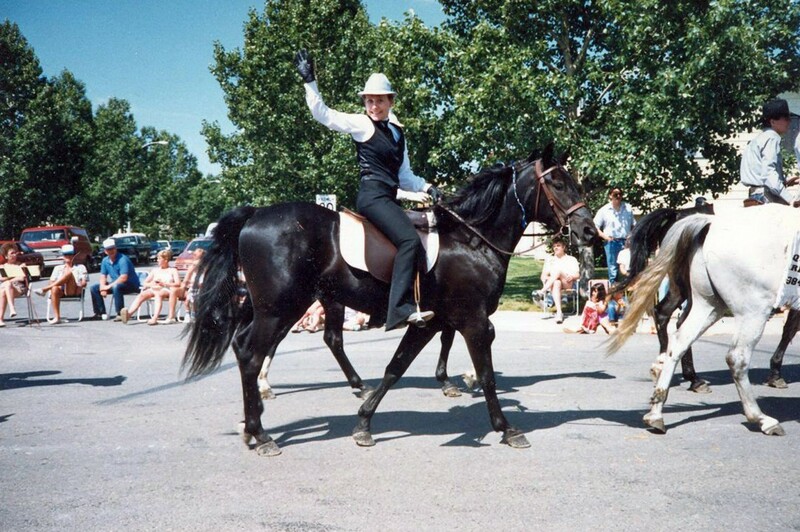 During my time at Calta Stables, I also had the chance to ride some of the Hack’s Tennessee Walking Horses. The first one was Royal, the most level-headed young horse I have ever met. 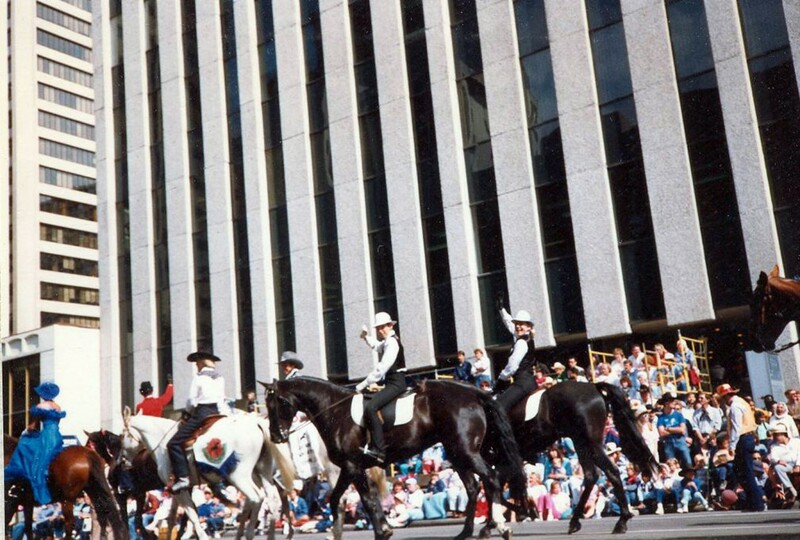 After his basic training by Hilton Hack and four days in the Easter clinic with me aboard, Royal was a complete rock star in the Airdrie and Stampede parades. You’d have thought he’d done it a million times, walking the parade route like an old campaigner, completely unfazed by the crowds, the flags, the marching bands, the wagons, or any of the other potentially horse-terrifying things. If I’d been in the market for a Tennessee Walking Horse, he would have been my guy. Royal went on to a new home later that year and continued his rock star behaviour. Another of the Hack horses I had the opportunity to ride was Jack. Jack and I played the Lone Ranger and Silver during the light horse demonstrations at the Calgary Stampede. For safety reasons, Jack hadn’t been taught to rear like silver, but we did gallop into the arena to the William Tell Overture. When I wasn’t in my disguise as the Lone Ranger, I was a southern belle, riding in a buggy behind the Hack’s beautiful and multi-talented stallion, Calta Midnite Victry.